If you’re a fleet service supplier that’s introduced a new service or solution this year, then Fleet World would like to hear from you for the ‘Innovation’ categories in our 2018 Fleet World Honours awards. Open for entries until Monday 15 January 2018, the Innovation awards span the full fleet spectrum – from contract hire and leasing to customer service, SMR, remarketing, risk management, driver management, rental, fuel saving/management, cost reduction, mobile comms, telematics and accident management. And next year’s Fleet World Honours will recognise Innovation in Electric Mobility. 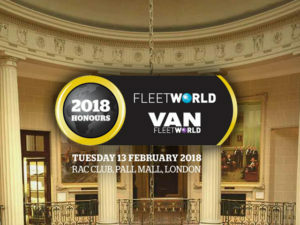 Awards will be presented at the annual Fleet World Honours event held at the RAC Club, Pall Mall, London on Tuesday 13 February 2018 and will also recognise the latest developments by carmakers. For more details and for entry forms for the Innovation categories, click here. The 2018 Van Fleet World Honours will be presented at a separate event, taking place at Twickenham Stadium on 22 March 2018. Entry forms for the Innovation categories will be available shortly.